Walker: After I made the endorsement of Ted Cruz, the other frontrunner came out and didn't just complain about it, he attacked not just me personally, but he attacked the things that we have done. He said that the state wasn't doing very well. When the voters -- even some voters who were open to Trump as a candidate -- when they heard that, I think that turned them off because they knew the facts. They'd been in the trenches with the recall. They'd been out getting the message out and they saw that, for example, we just passed three million people employed in our state, which is the greatest [number] we've ever had in our state. They know that we have a balanced budget. They know that the reforms empowered schools to do better than they've ever done before. They've seen the facts -- they've lived them; they haven't just heard about them, they've actually lived it. And so when that candidate attacked not just me, but attacked our reforms, I think a lot of voters in the state took it personally. Benson: What does it say to you about that candidate, Donald Trump, that he came out and was critical of, for example, your budget policies, which are almost universally lauded among conservatives? He was critical of you for not having raised taxes on the people of Wisconsin. GB: He repeated talking points that have been debunked over and over again, that were advanced by your Democratic opponent in 2014. 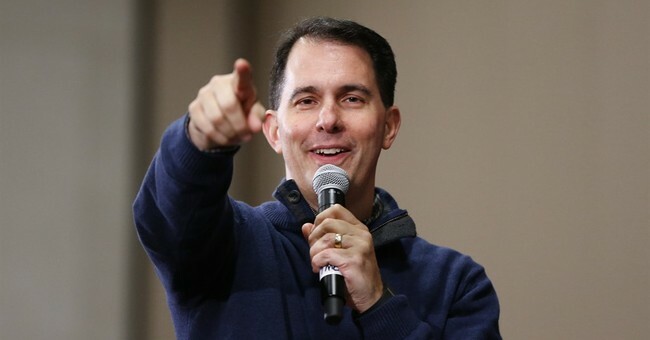 If you're sitting there as Scott Walker saying, 'hang on, this is the man leading in a lot of the polls -- almost all the polls -- for the Republican nomination? Whose attack line against me is that I didn't increase the tax burden on Wisconsinites?' Does that set off alarm bells for you, as a conservative? SW: It does, and again I think that's why Ted Cruz did so well in Wisconsin. The people knew the facts. They knew that what [Trump] was saying were basically the talking points of the Left. They didn't work in '12 or '14, they didn't work not only against me, they didn't work against others. It is concerning, I think, in a larger context. That's why in states where the voters are getting a broader breadth of information, I think Ted Cruz is going to do well in the future. The challenge is nationally, voters just aren't hearing it. They're not hearing it from many of the networks covering these elections...if people aren't getting even and accurate coverage, you can see why people aren't hearing things like this, but I think when voters see it -- and to your point, exactly, someone complained that we didn't raise taxes? That might be an argument you'd hear from Bernie Sanders or Hillary Clinton...it certainly isn't going to work in a Republican primary, where I think voters, particularly in light of the last few days with tax day, appreciate governors and lawmakers who are willing to stand up and not only not raise taxes, but actually lower them, which is what we've done in Wisconsin. Asked whether he would follow Paul Ryan's example and comprehensively rule out the possibility of being drafted as a 'consensus' nominee at a potential multi-ballot GOP convention, Walker somewhat bypassed the core question, instead emphasizing his belief that Cruz will prevail on the second or third ballot, after Trump fails to clinch the nomination with the requisite 1,237 delegates. The closest Walker came to echoing Ryan was his strong warning that most voters would view the party nominating someone other than one of the current frontrunners as "unfair" and "not right:"
GB: Just a few days ago, your fellow Wisconsinite Paul Ryan had been the subject of all sorts of rumors and buzz about whether he was angling to have his name entered into the mix at some point. He finally had enough and issued a Shermanesque denial: 'I'm not going to do this, I will not be the nominee, I won't accept the nomination.' There has been some some buzz, [at] a lower decibel level, attached to your name -- a few pieces popping up here and there. Are you willing to do the same thing Paul Ryan did and say, 'Scott Walker will not be the Republican nominee for president, period'? SW: I firmly believe that because of what we did in Wisconsin that Donald Trump will not get to the 1,237 delegates needed going into the convention. I believe that no one will have enough delegates on the first ballot, and I believe that either on the second or the third at the latest, I believe that Ted Cruz will win. And the reason I say that is I believe that Cruz will be close, but will be a bit behind Trump coming in, but neither will be at 1,237. And as we've seen in our state -- we've seen up close in our state, Wisconsin -- but we've seen it elsewhere around the country, that the Cruz camp, to their immense credit, have really connected with the grassroots. And even in states where Trump has the majority of the delegates on the first ballot, [Team Cruz has] gotten the delegates selected through their grassroots organization so that once a second or subsequent ballot is taken, they're in a position to win them over. Plus I believe that, for example, delegates assigned to Rubio after the first ballot will overwhelmingly go to Cruz, as opposed to Trump. So I just firmly believe that on the second, maybe as late as the third ballot, Ted Cruz will win. I don't see whether it's names like myself or Paul Ryan or anyone else out there, I just don't see the delegates picking someone who hasn't been out as one of the frontrunners. Doesn't have to be someone who comes in with a plurality, but someone who's out front. It's like, even though I like John Kasich, he's a friend of mine, I don't see any way that Kasich or anybody else gets it. Because that, I think, to most voters who've been behind either Cruz or Trump, really would be viewed as being unfair and not right. I think it will be one of those two. And I still believe on the second or third, it'll be Cruz. SW: Literally, I laughed. It was not just a 'LOL' moment on my phone. I literally laughed out loud. It was breathtaking. GB: Is that the same, though, as saying no? Is that the same thing as categorically ruling out running as Donald Trump's running mate, if he were to ask you? SW: I have absolutely zero interest in that. The reason I laughed is I thought it was amusing after getting attacked over and over again, incorrectly as you duly noted, the idea of, one, him mentioning me along with Rubio and Kasich really was breathtaking. And secondly, I want to support somebody who admires the work that we've done in this state because it's worked. It's worked not just because it's Wisconsin. It's worked not just because it's me. It's worked because principled conservative leadership, even in a blue state like Wisconsin, can win. GB: Speaking of Wisconsin, I know that you're currently undeclared for 2018. You are not term-limited in Wisconsin. You've served two terms, although it sort of feels almost like three because they forced you to get elected again. Are you inclined to run for re-election? Let me put it that way. SW: Yeah. I am, without a doubt. I love what I do. We get good things done. It's a benefit to the people of Wisconsin, but I think it also has a positive impact on people across the country if we can show other Republican governors and Republican lawmakers that even in a blue state like Wisconsin, we can get positive reforms done. And in turn, not only get elected, but see those reforms work for our people. I think that's a good thing. Walker added that his focus in the interim will be to pass tax and welfare reform in his state, with an eye toward a goal of full employment -- while using his forthcoming role as Chairman of the Republican Governors Association to encourage conservatives to govern boldly at the state level, using Wisconsin's achievements as an example. Our conversation with Gov. Walker will air in its entirety on tomorrow morning's edition of the Hugh Hewitt Show.